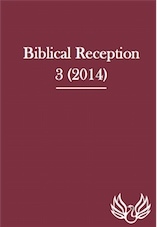 This is the third volume of the journal, Biblical Reception (BibRec), due to be published in November 2013. For the first volume, click here, and for the second, click here. When we founded the journal our policy was this: it was high time, we believed, for the new and burgeoning field of the reception of the Bible to have a publication medium of its own. What the biblical text has meant to its readers down the centuries should be as much the subject of scholarly attention as any ‘original’ meaning. Our journal is a substantial annual volume covering all kinds of use of the Bible — in art, literature, music, film and popular culture, as well as in the history of interpretation. Papers for the fourth volume are being solicited, and should be submitted before September 31, 2015. The preferred length is 5000 to 8000 words; the Sheffield Phoenix Press style sheet may be found at www.sheffieldphoenix.com/authors.asp. Submissions should contain, beneath the title, an abstract of c. 250 words, and be sent electronically to Diane Apostolos-Cappadona (apostold@georgetown.edu), with a copy to J. Cheryl Exum (j.c.exum@sheffield.ac.uk). Papers will be peer reviewed. Diane Apostolos-Cappadona (Washington, DC), Alan Cooper (New York), James Crossley (Sheffield), Andrew Davies (Birmingham), Tamara C. Eskenazi (Los Angeles), Philip Esler (Gloucester), Susanne Gillmayr-Bucher (Linz), John Harvey (Aberystwyth), Christine Joynes (Oxford), Carol Newsom (Atlanta), Martin O’Kane (Lampeter), Tina Pippin (Decatur, GA), John F.A. Sawyer (Durham), Reinhold Zwick (Münster). J. Cheryl Exum is Professor of Biblical Studies at the University of Sheffield.